The iPotty for iPad potty training device: Brilliant parenting tool, or crappy idea? As the mother of a 3-and a-half year old who’s just mastered toilet training, I’m not sure what to think of the new iPotty. 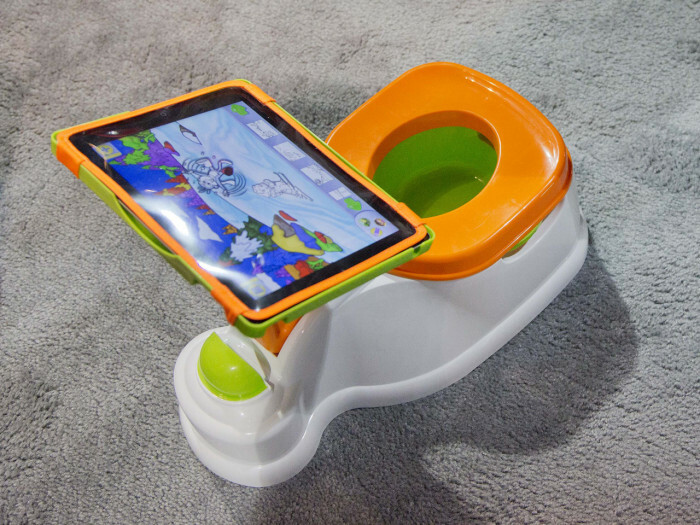 Unveiled last week at the 2013 Consumer Electronics Show in Las Vegas, the base of the iPotty looks like a regular ol’ plastic toilet with removable bowl— but there’s an adjustable stand attached, specifically for an iPad. Due out in March, the $40 iPotty is the brainchild of CTA Digital, which already makes a kiddie sized iPad play table. Everyone's first reaction seems to be that the iPotty feels like a terrible idea, yet another way we’re teaching our kids to rely on a constant stream of over-stimulation. Pulling out the iPad for long car rides and flights feels like one thing. But really, an iPad for your baby, in the loo? Indeed, the very idea of the iPotty makes Chani Sanchez, a writer and Brooklyn mom to a 7-year old, uncomfortable. “[It’s] like the last sacred place— the toilet— has finally succumbed to the noise of the information age,” says Sanchez, who doesn’t think any of us thrive in a world so full of digital distraction. For Dina Light-McNeely, a mother with a 4-year old in Dallas, Texas, the bathroom is no place for technology of any kind — especially when toilet training. On the other hand, some toddlers have a really, really tough time with toilet training — and parents, by extension, need all the help they can get keeping those tiny rear ends on the potty long enough to teach them how to do their business. As a mother who’s spent many an hour on the shower mat, with both legs asleep, reading “Everyone Poops” and “The Gas We Pass," I have to wonder how bad a little iPad or iPhone help could really be. Dr. Cynthia Mann, a pediatrician in Hamden, Conn, has not seen the iPotty, but she’s not a fan of using the iPad or i-anything to keep a toddler seated during potty training. She prefers the old-fashioned approach on the shower mat, reading a few books to your little guy or gal to keep them settled long enough to accomplish the task at hand. She says the biggest problem doctors in her practice, Whitney Pediatrics, see with young kids and the iPad, or similar interactive electronic devices, is that there’s no discrete end or time-limited option. Because 2- and 3-year olds don’t really understand the concept of five or ten minutes, parents can find themselves facing a full-scale meltdown when it’s time to close an iPad after the deed is done. Books, she points out, have a clear end point that make it easier for small children to grasp when it’s over. Dr. Mann also reminds parents of the American Academy of Pediatrics guidelines for children over 2, which limit total screen time to no more than two hours per day of educational, nonviolent programs, supervised by an adult. Toilet training with the iPotty, of course, would count toward that total. “The big concern with something like the iPotty,” says TODAY contributor and psychologist Michele Borba, “is the potential for addiction.” Parents everywhere are witnessing the unattractive behavior the iPad and similar technology can unleash in their otherwise sweet toddlers. The danger, according to Borba, is that kids will become dependent on the iPad stimulation, and actually need it to relax to go to the bathroom. But some child development experts see the iPad or iPod Touch quite differently—as a powerful incentive for kids who need that extra little nudge during the toilet training process. Maria Zimmitti, Ph.D., is a clinical psychologist in in Washington, D.C. who works with children and their families, and specializes in potty training consulting for parents and toddlers. So according to Zimmitti, there’s absolutely nothing wrong with using the iPad as a motivator for potty training— the same way a parent might use a piece of chocolate or toy train as a reward for getting through the school day in dry pants. Of course, the secret to using the iPad successfully, she reminds parents, is that, like anything else, you need to set firm boundaries, and you need to stick to your rules. There was nothing like an iPotty on the market last year, when Amy Pawlak, a mother of two toddlers in Barnard, Vermont, toilet trained her 3-and-half year old son, Sam. But she could see the usefulness of one. “We used many incentives and forms of entertainment to lure Sam to sit and stay on the potty, including books, lollipops, and toy cars,” says Pawlak, a registered nurse. At one point, she placed a portable DVD player on a stool in the bathroom for him to watch while he waited on the potty.